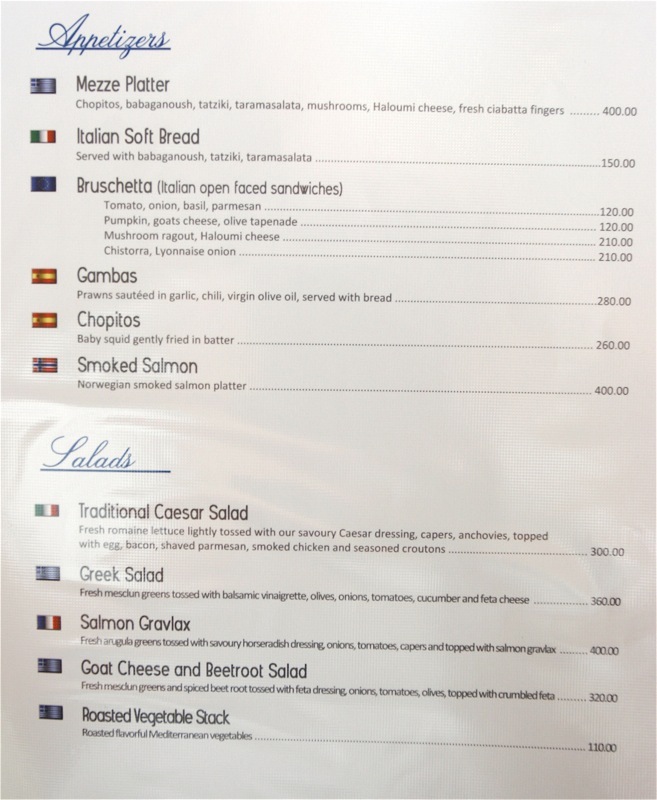 Gaster – a modern european deli which means “stomach” or “belly” in greek. In its 4th Reincarnation, Gaster Deli @ 6750 is perhaps receiving good karma these days. This is the fourth transformation of this corner restaurant in 6750 by the same owner which used to be known as Giraffe, Dream Bar and in its recent past life, Quisine. The highly anticipated opening of Gaster Deli last Monday, May 21, was well received by the 6750ers which includes folks from our company, caltex, microsoft, etc… The food is expensive and there is a bet whether Gaster Deli would survive this time around. This is the closest we could get to a Cafe Central setup (ala Friends) near our office. Good thing they serve good Illy’s coffee (suppose to be the no.1 coffee in Europe) as their secret weapon against Starbucks and UCC. So far, we are getting great raves and reviews from people who have tried it for the first time. We tried all the pasta and rice options, which is the only affordable meal for us, and all of them were great! I heard people raving about their prime rib (P770+), and strawberries in the shelf, etc. As if all the people who have tried their food on their first week of operation, came out with songs of praises and a vow to come back the next day. As for me, I’ve eaten thrice in the span of 5 days, and can’t wait to try their wide assortment of gaster-deli-cious menu. 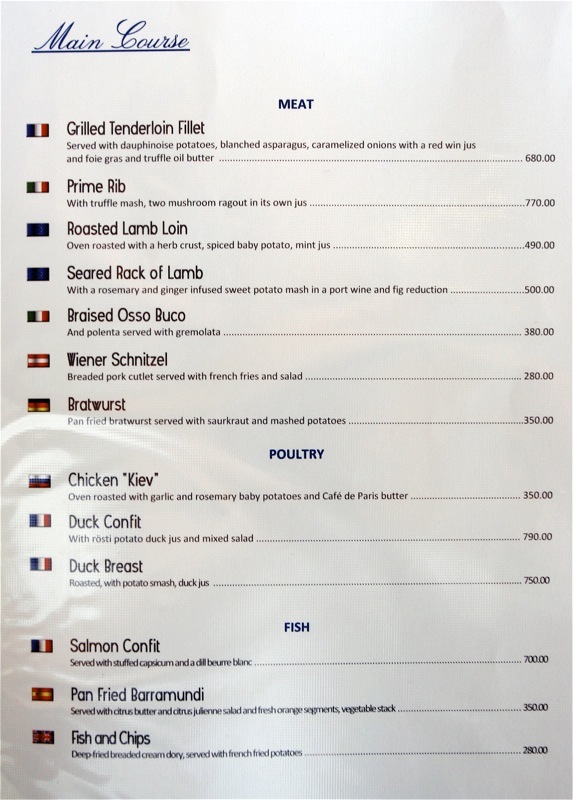 Main Course – Meat, Poultry and Fish — The prices are enough to keep me turn quickly to the next page. Soups, Pasta and Rice — Only items we can afford when eating out for lunch. 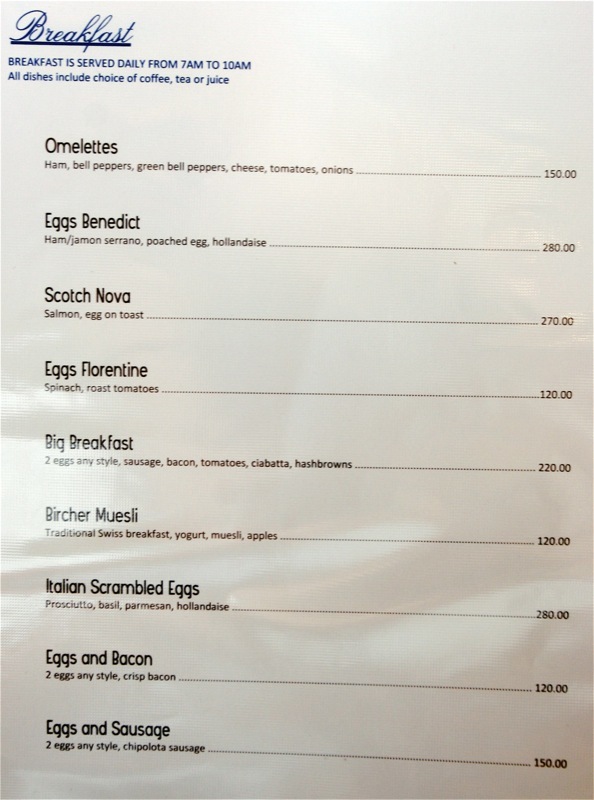 Breakfast Menu — I can’t wait to try this next week. 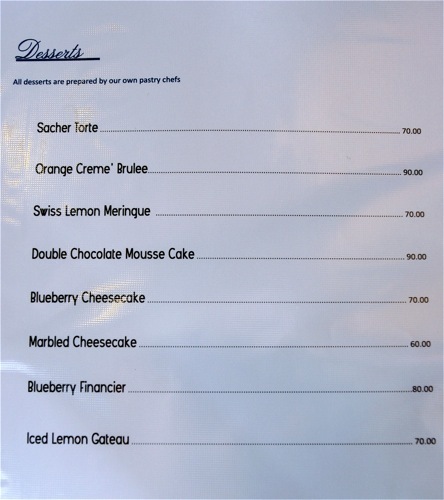 Desserts Menu — decent desserts but I wouldn’t go here just for this. A gourmet resto with integrated retail shelves? I’m sure it is just a good excuse to be unique but I did not like the mix. It would have been better if it was gourmet resto, cafe and a karaoke bar 🙂 Or why not just create a Cafe Central like the one where the Friends gang would hang out? In terms of design, the accent pieces like the lamps and wall patterns were done very well. Although you could notice the poor workmanship in the crooked floor tiles or the warped plywood ceiling. You could see that they have to rush through the setup of the resto so that they could open in time in May. “Our gourmet section showcases the finest goods that money can but (?) from the world food markets. 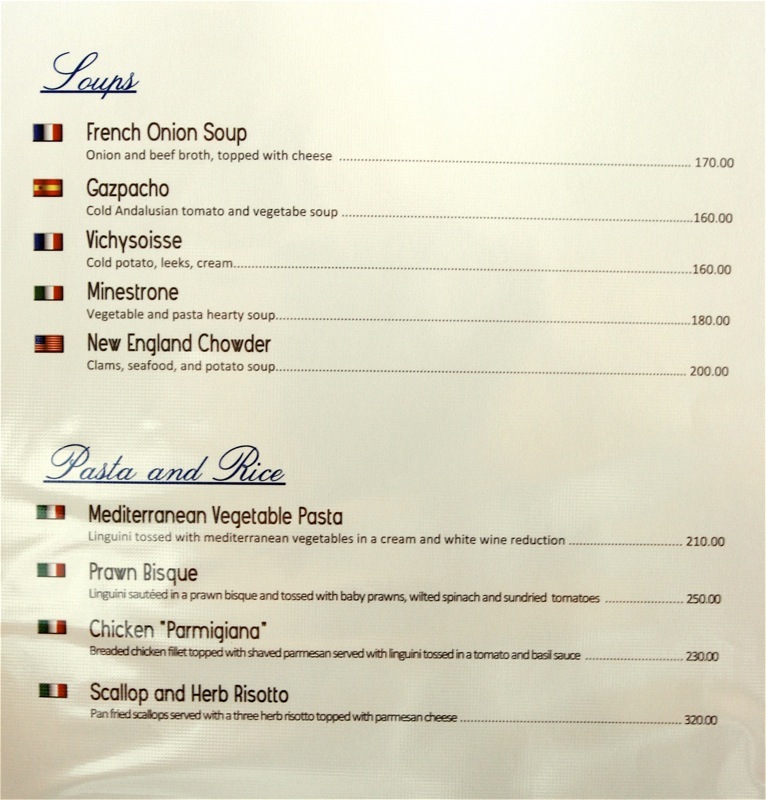 Ok I detected a wrong spelling in their menu– the “but” should have be changed to “buy”. But who am I to criticize, I make a lot of grammar sins and spelling errors in my blog! (sorry for that 🙂 As for the selection of goodies in the deli, I don’t have feedback if the items are really uniquely imported just for gaster deli or you can just buy the stuff anyway in Cash & Carry, Landmark or Rustans. I saw a keg of the best beer in Germany which costs P1,400! I want to try it during a team celebration. Here is a view of the mezzanine floor where they can accommodate a more intimate setting of group lunches/ dinners. I love the tamasalata dip. The soft bread feels soft but heavy when you eat it. 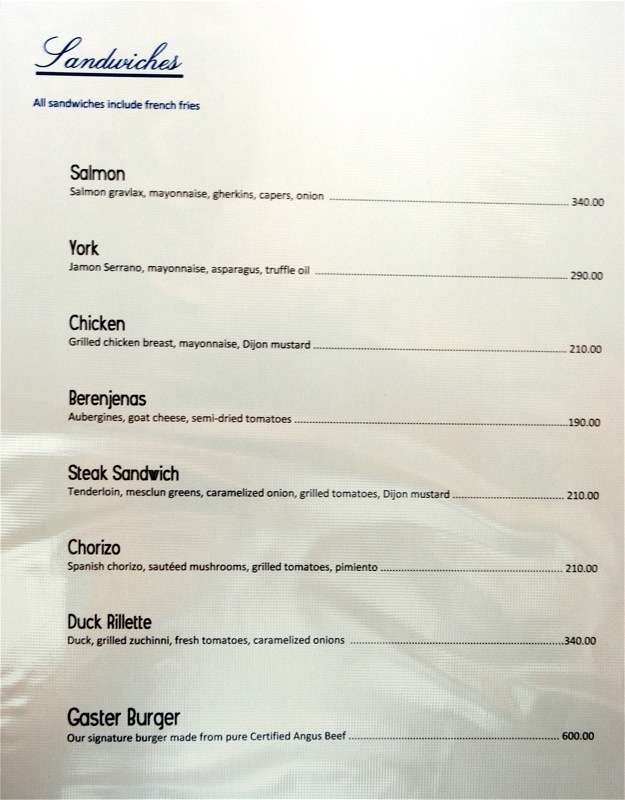 P50++ for one long bread and a dip, is expensive don’t you think? Prawn Bisque (P250++) – Linguini sauteed in a prawn bisque and tossed with baby prawns, wilted spinach and sundried tomatoes . If you like prawn bisque taste, then this pasta is for you. The pasta servings are good for two despite the fact that the waiters insist that it is only good for one. You could decide to share but there is a feeling that sharing is not allowed in Gaster Deli. Chicken Parmigiana (P230++). Breaded Chicken fillet topped with shaved parmesan served with linguini tossed in a tomato sauce and basil sauce. I know of two persons who tried this and both of them are raving about how good the tomato sauce and basil combination. Also, the addition of the chicken makes this dish all worth it! Scallop and Herb Risotto (320++). Pan fried scallops served with a three herb risotto topped with parmesan cheese. I will order this next time. I never had the guts to ask for a bite just to taste this. Looks good, yummy, and rich in carbo. Iced Lemon Gateau (P70++). If you are looking for a good dessert to end your meal, try this lemon gateau. What is a gateau? It is a rich sponge cake mixture, filled with cream and iced. It is french for cake. I like lemon cakes when I got introduced to it when I ordered the Lemon Torte from Roshan. Orange Creme Brulee (P90++). Just a perfect serving of creme brulee. I love the long back chairs! This is one of my favorite spot. Did I mention that Gaster Deli has a lovely young staff? Thanks for the great service so far ! Gaster Deli @ Ground Floor of 6750. Wow, I remember someone telling me they were going to do a Greek deli there. It will be nice to see what goods they have to offer. The prices seem fair given the location of the restaurant. Despite their name, they don’t really seem to serve food that I’d associate with a deli. Still, this place is worth a go since I’m in Glorietta almost every other day. I must say that the desserts really don’t excite me, however. Those prices look quite good, given the nature and serving size of those dishes. Will try this one out sometime soon. Thanks for the tip! I can’t wait to try Gaster Deli. The desserts sound enticing! I hear it’s owned by the same owners of Gaudi. If it’s anything like Gaudi then this place must be good! wow..so great…and so yummy…all your blogs are so informative and mouth watering….can we be friends to join u in food tasting and trips kahit po taga comment (hehehe), besides your are so lucky to have all the means to experience that lifestyle…kami heto masisiyahan na po sa pagbasa ng blog nyo..pero sa abot ng aming makakaya ay malaking bagay po ito because we know na where are the better places to go…because bonding with my family is our best concern…and your blog is really a great help to us…more power po and God bless…. Hi I’m Sheena the Dining Supervisor of Gaster Deli, thank you for the kind words, we’ll make sure we’ll live up to your expectations. For the price that was commented, for sure you won’t mind that specially it’s not that high compare to other restaurants that would give the same kind of service and not to mention a big and DELICIOUS meal. We are open from 7am to 11pm. We also accept reservations. Thank you Mr. Anton for putting us in your wonderful blog! Had lunch here today. The prawn bisque pasta lives up to our expectations, taste- and quantity-wise! The Chicken Kiev was different from the usual Chicken Kiev we know – no butter oozed from it when cut, though it DEFINITELY tasted of butter. The accompanying garlic & rosemary baby potatoes were scrumptious, and I’m not usually a potato fan. Am not a big fan of the dessert selection. We had the double chocolate mousse but it’s just okay for me. Thanks for the reco! I know i sound particular, but they misspell a lot of names. You’d think they might get this right. Will try this next week! I’m having dinner here tonight! I have a weak spot for breakfast. But wait, no pancakes or waffles? *Wail of despair* Refillable ba ang coffee? The food here is great!! Try the rack of lamb!!!! its worth every centavo!!! And why not!? mah boys CK and Mike are doin their thing in the kitchen!!! !